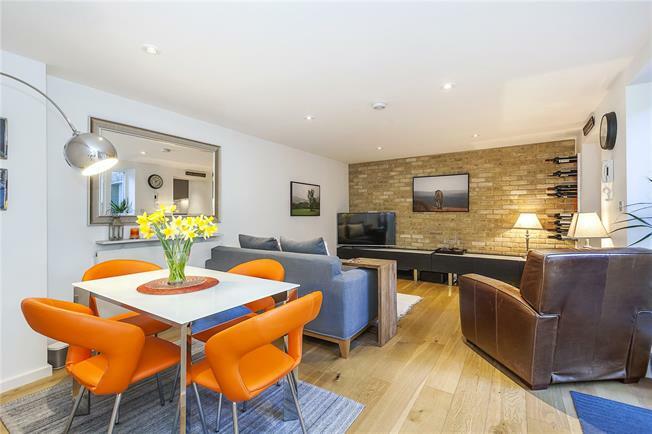 Set on the ground and lower ground floor of a former tool factory that was converted in 2013 and has been lived in by its current owners since, this beautifully presented three bedroom is a wonderful example of a period conversion with a lovely blend of period features with a modern, contemporary finish. After entering through the communal main door, the property is then accessed through its own private gate taking you into the lovely patio garden set over two levels featuring automatic lighting which is great for those summer evening get-togethers. The reception is located on the lower ground floor and leads directly out on the garden through French doors expanding the entertaining space. The kitchen is located just off of the living room and features fully integrated appliances with a very smart and modern finish. There is also a guest wc/utility room located on the lower ground floor along with the third bedroom which is currently utilised as a very useful study. The two principal bedrooms are both a very good size and each have ensuite bathroom/shower rooms, built-in wardrobes and impressive high ceilings flooding the apartment with natural light. Further features include ample storage space throughout, a full irrigation system in the garden and communal bike storage for residents. With a contemporary, neutral decor throughout, it's the ideal long-term home for any discerning buyer. The Toolworks is at the southern end of Catherine Grove within the popular Ashburnham Triangle Conservation Area, set well back from the junction of Blackheath Road. The Docklands Light Railway at Deptford Bridge is just moments away offering access in to Canary Wharf in 20 minutes while the overground at nearby Greenwich takes you into the City in a similar time. All the shops, bars and restaurants of Greenwich are nearby as are the open spaces and historic buildings at Greenwich's Royal Park.